With dazzling light shows appearing at almost every turn, West Virginia isn't shy about really turning it on for the holidays. So big, you'll need a map. 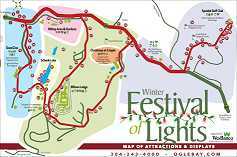 • A Wheeling WV must-see is the Oglebay Christmas Festival of Lights, one of the largest Christmas light shows in the USA covering more than three hundred acres over a six-mile drive-thru in Oglebay Park. • What sounds better than celebrating Christmas in Shepherdstown? Each year the WV town pulls out all the stops with a live Nativity scene (complete with sheep), crafts demonstrations, historic reenactments, and a holiday parade featuring Santa who arrives on a horse-drawn carriage. • When that "Charlie Brown Christmas tree" made its official debut in in 2016 in Fairmont, WV, an online controversy was born. Memes were created and photos went viral as Facebook critics nicknamed it "Stumpy", while defenders countered with "all it needed was a little love." But, love it or hate it, the humbly decorated tree stood there proudly that season as the most famous Christmas tree on the Internet. Harpers Ferry Olde Tyme Christmas - Get in the holiday spirit on streets decked out in holiday decorations, merchants dressed in period costumes, and a schedule of family-friendly activities including musical events at St. Peter's Church. Christmas in Parkersburg - Check out the full December calendar of events including holiday parades, kid-friendly activities, entertainment, historic home tours and craft demonstrations in and around town. Christmas at the Charleston Civic Center - Browse the event calendar for traditional holiday performances by the Trans Siberian Orchestra, along with Nutcracker ballet performances and holiday concerts. South Charleston Christmas Parade - The D Street spectacle has Santa arriving by helicopter at the Oakes Field Football Stadium. WV State Farm Museum Holiday Light Festival - Point Pleasant features more than three million lights twinkling throughout the grounds. Includes visits with Santa and free hot chocolate and cookies for the kids. Christmas Tree Farms in West Virginia - Where to find precut and choose-and-cut Christmas tree farms throughout the state with contact details, hours of operation and driving directions. West Virginia - Where to Eat, Sleep & Shop!